This realistically aged set is really creepy! Mesh see-thru bag with TWELVE (12) life size assorted dismembered bones, including 1-decapitated skull head, 2-severed hands, 2-cut off feet, 1-femur, 1-tibia, 1-rib, 1-spinal vertebrae section, and 3-more assorted pieces as pictured. It looks as though you have a bag with a real disarticulated skeleton inside. 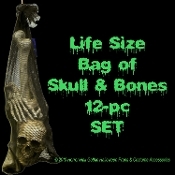 Display dismembered body parts complete hanging in black mesh bag, or use as creepy budget props strewn about your cemetery graveyard, pirate scene, mad scientist laboratory, witch cauldron, morgue autopsy room, haunted house wreaths and table decorations. Made of lightweight dense polystyrene styrofoam material. *Note: *Protect from Sun, moisture and wind if used outside.